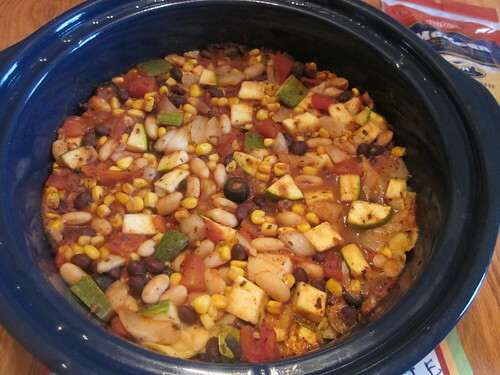 Once a month or so, we try to make something interesting and new using our slow cooker. Often, we try to make modifications of ordinary dishes to see if they’ll work in the slow cooker. Sometimes this works well and you end up with a good replication of the original dish. Sometimes it’s awful and you wind up with something barely edible. Then there’s that third case, where you expect a duplicate (or something close) of an original dish, but the crock pot version ends up being good on its own, but very distinct from the original. We like to make vegetable-heavy enchiladas. We’ll pack all kinds of vegetables into the tortillas, wrap them up, and bake them in the oven. In fact, I wrote about these enchiladas (in a slightly different form) a few months ago. What happens when we try to translate that dish into a crock pot version so we can just start it in the morning, walk away, and eat in the evening (perfect for a busy day)? What you need, more than anything else, is a pile of vegetables. Here’s what we used. Many of these items came straight from our garden. You may also wish to add meat. If so, try out 1 1/2 lbs cooked chicken, shredded. For spicing, you’ll want 2 tablespoons chili powder, 2 tablespoons ground cumin, 1 tablespoon basil, and 1 tablespoon oregano. You’ll also need 10-12 tortillas, corn or flour. Chop all of the vegetables. 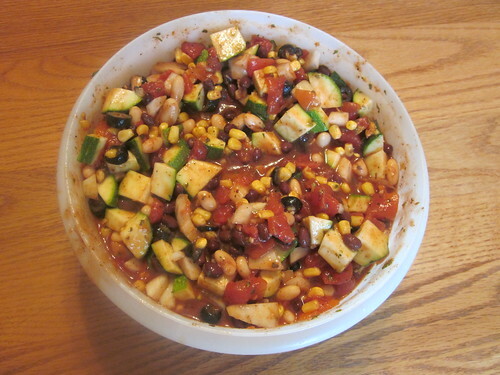 You can put all of the chopped vegetables right into the same large bowl if you’d like. Put roughly 1/4 of the contents of the bowl in the bottom of the crock pot. 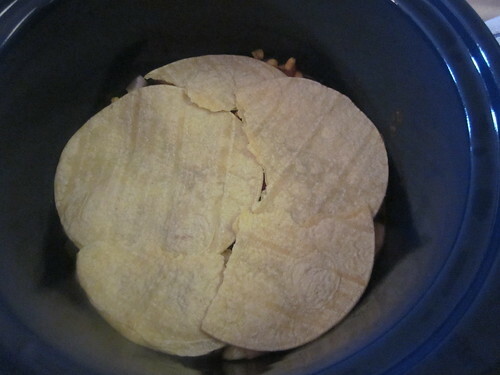 On top of that, put a layer of tortillas, enough so that the below layer is covered. On top of that, keep layering. Add 1/3 of the remaining mix on top of the tortillas, put another layer of tortillas on top of that, then put 1/2 of the remaining mix on top of those tortillas, put another layer of tortillas on top of that, then put the rest of the mix on top. 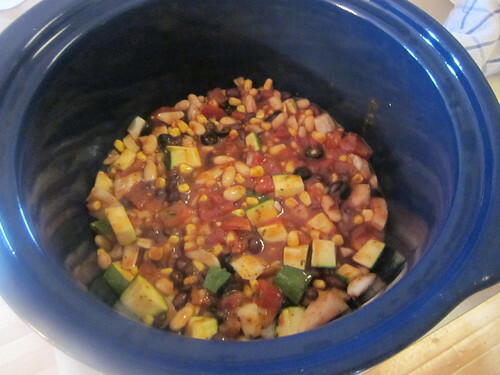 Cover the crock pot and cook it on low for six to ten hours. You’ll end up with something looking like this. We like to serve dishes like this with simple rice. 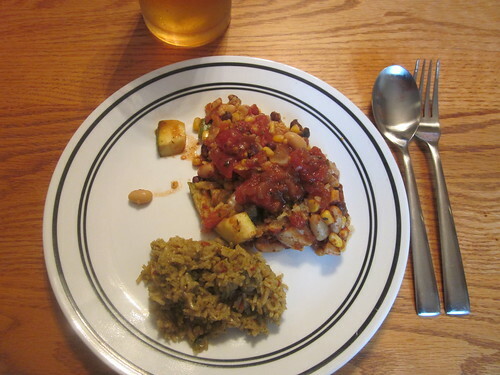 We cooked ordinary rice in vegetable stock, then added some salsa near the end of the cooking. That’s dinner! Everyone seemed to enjoy it. Obviously, there’s some strong flexibility with the vegetables you add. You’ll want to keep it around 12 cups of total vegetables, but feel free to eliminate a vegetable you don’t like or add one that you do like that makes sense (like tomatillos or something). You can also try different proteins, such as chicken or shredded beef or ground beef. Cook these before adding them to the initial mix.